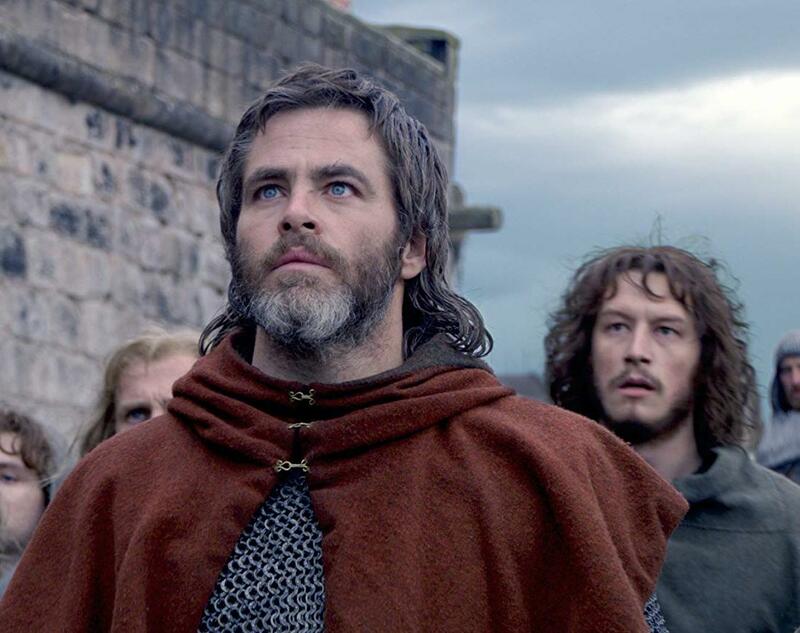 This is a movie review of the Netflix Original film, Outlaw King, the story about Robert the Bruce or Robert Bruce. It stars Chris Pine, Stephen Dillane, Rebecca Robin, Billy Howle, Paul Blair, Sam Spruell, & Jonny Phillips. It's directed by David Mackenzie (Hell or High Water (2016), Perfect Sense (2011) and Starred Up (2013)). Though the films are not related to each other in any way, this film takes place not long after events in the Mel Gibson starrer, Braveheart. Events in this film tells the story of how the 14th century Scottish 'Outlaw King' Robert the Bruce used cunning and bravery to defeat the much larger and better equipped occupying English army. After being crowned the King of Scotland, introduced or granted a marriage to his wife, Robert the Bruce is forced into exile by the English after he murders a rival under the flag of truce. After that, he finds himself on the run and takes his family and his scattered followers on a terrible journey of retreat and betrayal until he gets smart and starts to use the land to his advantage to defend against his rivals and start his journey to reclaim the throne. The first act is pretty much developing the characters, the historical situation, and the personas of our characters. Here, we learn that Robert is quite the gentleman with his new bride queen and what not. The second act we watch Robert being pursued by the English and all kinds of bad things happen to those who support Robert, but by the third act, he starts getting his 'ducks in a row' and figures out what they need to do to get back on track to the throne. While watching the film, most of the time it feels like this was an almost epic "true to historical events" kind of film which does not necessarily lend itself to an exciting drama, but rather, a somewhat gory and exciting History Channel focus piece. It's true that the film depicts the heroism in committing to supporting Robert and fighting for what they feel is right. But like a good documentary with an above average documentary production, it was not riveting but it was not horrible either. There is some gore a few times in the movie that is extremely realistic for the time period with war and criminal punishment. All in all, it was a good film to have on in the background while doing something else on a computer or what not but I think I would have been very bored if this were just me sitting on the couch watching this.